Trout are back in Community waters, and this weekend’s cold and rainy weather could be just the ticket to get trout whacking your favorite bait or lure. The “core”Community waters are being stocked this week. There also have been some adjustments to these trout stockings. Read all about them. For desert bass fishing, this weather that’s dropping into the low-40s at night could really slow the metabolism of fish. Crappie fishing, which has been hot at Roosevelt Lake in the Tonto National Forest, also should be a bit slow until the weather stabilizes. The best bet this weekend may be hitting a window of dry weather and catching some trout at your nearby Community water. Be safe if headed to the high country, and remember that we consider all ice on lakes unsafe. 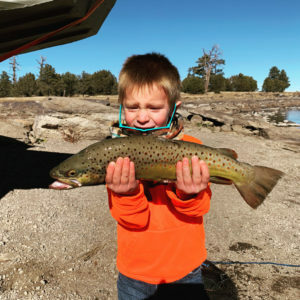 Anthony L. fished Saturday, Nov. 24, trolling a Rebel Bumble Bug-Hornet on the north end of the lake with son Brantley and nephew Braydon, catching a big rainbow trout and this monster brown trout. Rainbow trout: Verde River (Clarkdale to Camp Verde), Goldwater Lake, Community “core” waters. Saturday, 8 a.m.-noon. Dads: Bring Your Daughter Fishing Day! at Sahuarita Lake 15466 S. Rancho Sahuarita Blvd., Sahuarita.